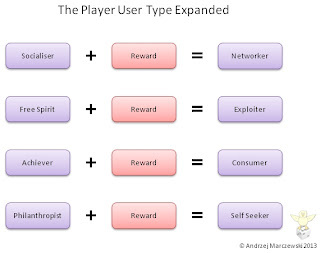 Why use Gamification Player Types? 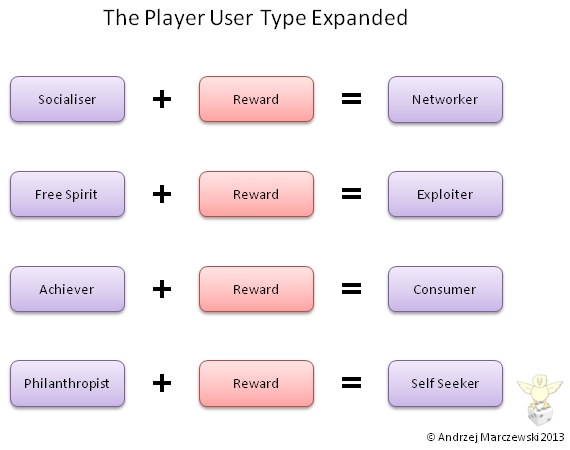 This post is about a new extended model of the Gamification Player Types that i developed with the guidance of Andrzej Marczewski (@daverage) based on his previous framework. So let´s start with some questions: why shall we create a model for player types? Is it neccesary or useful? Well, there are many reasons to use this kind of methodology, but among the most important is the need to fully understand what kind of people are going to be our players, in order to create the most compelling gamified system. One of the first steps to start designing a gamified system is to get some data about your target players to classify them into the different kind of players to create accurate "User Personas" (this is Jon Radoff´s word, some more info in his book "Game On"). To sum up, when applying gamification we need to have a great level of understanding about our players, in the same way businesses must know their clients to achieve excellence. 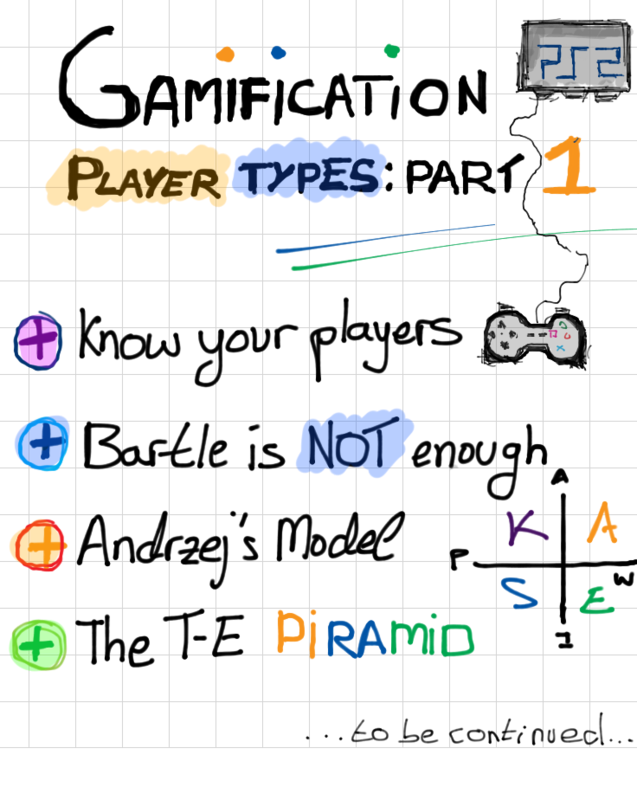 Once upon a time, Richard Bartle created one of his masterpieces, "The 4 Player´s Types" based on the different types of behaviours that he observed in the world of MUDs. Later on, and even though this model is no longer as useful for gamification as it was for that type of games in the past, it is still the very basics. Once we understand the basics of this model, it is the moment to move forwards to gamification nowadays. Once that the basics have been settled, let´s have a look at the main elements that this Time - Engagement Piramid is including, and the reasons why i developed this model. When looking at Andrzej´s model, we realise that there is a clear motivational factor underlying, and that players are motivated not only by extrinsic reasons but also by intrinsic goals. Furthermore, some posts before, i introduced the PERMA Happiness model created by Dr. Martin Seligman (you can check it out here: http://www.epicwinblog.net/2013/04/why-use-gamification.html) and linked it to the Self-Determination theory due to their connections. - We assume that every gamified system relies on autonomy in one way or another. Apart from this, i personally contacted Dr. Martin Seligman, and his answer on autonomy is that autonomy/control: "it is not a key element of happiness but enhances the others". So autonomy has been introduced in this model as a whole, as one of the main differences with Andrzej´s Model. - The first PERMA factor (positive emotions) is our first type of fun, defined as quick fun, or in other words, when people spend some time in our gamified system just for some minutes, getting some "pleasure" and leaving for a while. - Extrinsic motivation is defined by the intrinsic factors but only focused on rewards, as a way to further understand the extrinsic players. - Engagement is one of the main elements of Gamification and it has been taken as something that is achieved through all types of fun and it is defined by flow. - Last but not least, the more intrinsic fun our players are having, the more engagement and time spent on our gamified system. Great work done here Victor, but speaking frankly I don't like this concept and propsal for player typology for gamification. I am living with this maxim "keep it simple", and you model, regardless the fact that it is completely correct from the meritoric point of view, is very unclear and hard to read and interpret. What i can advise, try using more cleare construction. 2 dimensional or even 3 dimensional axis system, graphs, pyramids (but clear, as presented by prof. Werbach) are easy to read, understand and apply (and somehow natural, as we used to them already. Well, take into account that the model is not complete since the second part of this blog is coming. Furthermore, this framework is based on Andrzej´s previous work and unlike my former posts, this requires a bit more of knowledge to understand, basically, because it involves PERMA and SDT as the base. Besides, it is not trully validated and of course, people might have different points of view, but thats great! thanks for your feedback as usual Radoslaw! PS: how is your blog doing? I appreciate the concept of trying to expound on Bartle's player types and you putting into an easy to understand framework like a pyramid. I also find it funny that the word "farmers" has become a mainstay in the gamification community. Looking forward to seeing your feedback in other posts Jonathan!